Share the post "Album Review: OVERTURES – Entering The Maze"
Overtures are an Italian metal outfit from Gorizia and ‘Entering The Maze’ is the band’s third album. Metal infused with a large dose of melody is the order of the day and the band impress throughout. Taking cues from classic metal acts and adding in power metal touches the guys produce melody laden tracks complete with great playing and vocals. ‘The Maze’ kicks things off in fine fashion, a full on twin-guitar metal romp that has a twisting main riff with an Eastern influence and a soaring chorus. ‘Under The Northern Star’ follows in similar fashion, again with some excellent guitar work from Marco Falanga and Adriano Crasnich. The highlights of the album for me are the next two tracks, ‘Of Nightmares’ and ‘Savior’, as the band find themselves in full power metal mode with heavy riffs and vocal harmonies aplenty. Frontman Michele Guaitoli is particularly impressive on these with a strong delivery giving the tracks a symphonic edge. As well as the full on rock tracks the guys manage to slip in a ballad in the shape of ‘In The Middle Of Nowhere’ which reminded me of some of Maiden’s more recent efforts. The album is rounded off with the epic ‘The Oracle’ which is a well-constructed track that again showcases the band’s talents and once again has harmony and melody in spades. Along with the album there is a DVD, containing official videos, live recordings from the studio and audio tracks, which is an interesting addition and shows the band in full flight. ‘Entering The Maze’ is an impressive release and an album that deserves to be heard. Overtures may be one of the best kept secrets in Italy, go check them out. 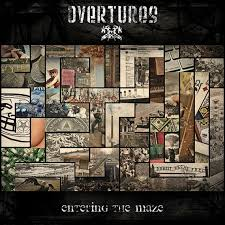 This entry was posted in ALBUM REVIEWS, ALBUM REVIEWS (Mobile), All Posts and tagged album, CD, Entering The Maze, Italy, metal, Overtures, review, rock. Bookmark the permalink.